Most of the time, brewers give comparatively little thought to foam. We brew our beers and foam appears on top of them. There is no single ingredient or procedure that creates foam, it simply emerges when a beer is brewed properly. However, there are things you can do when brewing that affect foam production and stability. It pays to understand these things, especially if your foam isn’t always what it should be. Large proteins, including LTP1, contribute to the formation of foam. Proteins such as protein Z and iso-alpha acids contribute to the stability of foam. It would seem logical that, in order to improve your foam, you could add ingredients with lots of these elements. However, there are some problems with that approach. For instance, wheat malt has more protein than barley malt. However, the more protein your malt has, the more likely your beer will suffer from haze. In some beers, such as hefeweizens, this is not a problem. But in most “ordinary” beers, haze is not wanted. In a like manner, hops add bitterness and aroma to beer and the amount of hops you add is going to be determined by the type of beer you are brewing. In almost every beer — even those made with a fair amount of low protein adjuncts (such as corn, rice or refined sugar) — there is enough protein to form a stable foam stand. And likewise, a beer does not need to be super hoppy to have good foam. If you are having problems with foam, the likely culprit is foam negative elements, not a dearth of foam positive elements. As such, if you suffer from poor foam, adding things to improve it is usually not the best option. There are foam enhancing additives, such as propylene glycol alginate and tetra iso alpha acids — the chemically altered hop extract, that is less prone to skunking, used by Miller and other brewers who bottle their beer in clear bottles — but these generally are not available to homebrewers, and certainly aren’t needed to produce good foam. One common practice among homebrewers is to add some wheat malt in the mash to build foam. Wheat malt has more protein than barley malt, so it is comparatively foam positive. (In a like manner, some commercial breweries add wheat flour to the boil.) This may not work and has some drawbacks. Almost any beer recipe should have enough protein in the grist to produce foam. If you are having difficulty getting good foam, it is most likely not from a lack of protein. In that case, adding wheat malt isn’t going to help. And, if you’ve added a substantial proportion of wheat malt, you’ve changed the flavor of your beer. You may also have rendered it more prone to forming haze. If you’re already getting good foam and a hint of wheat malt will make you beer taste better (or at least not worse), then go ahead and and add it. 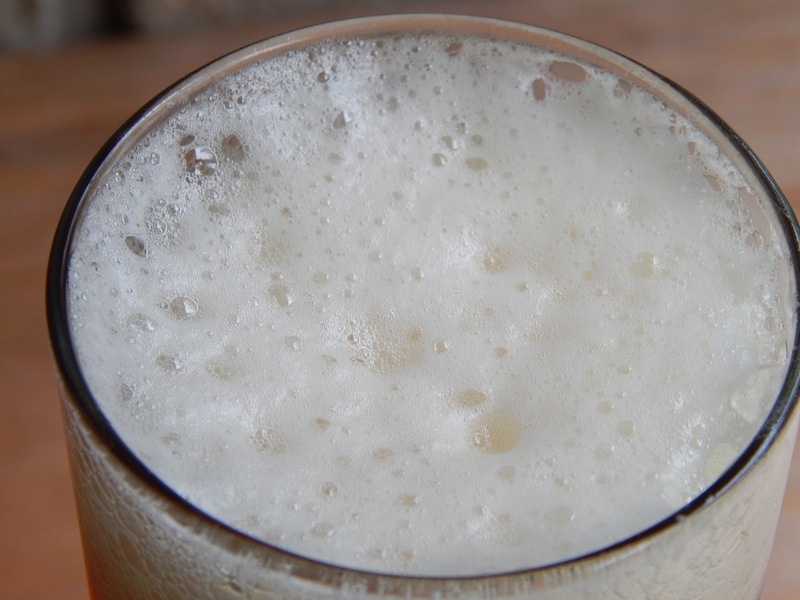 In an otherwise barley-based beer, you will likely see a slight increase in the amount of foam. 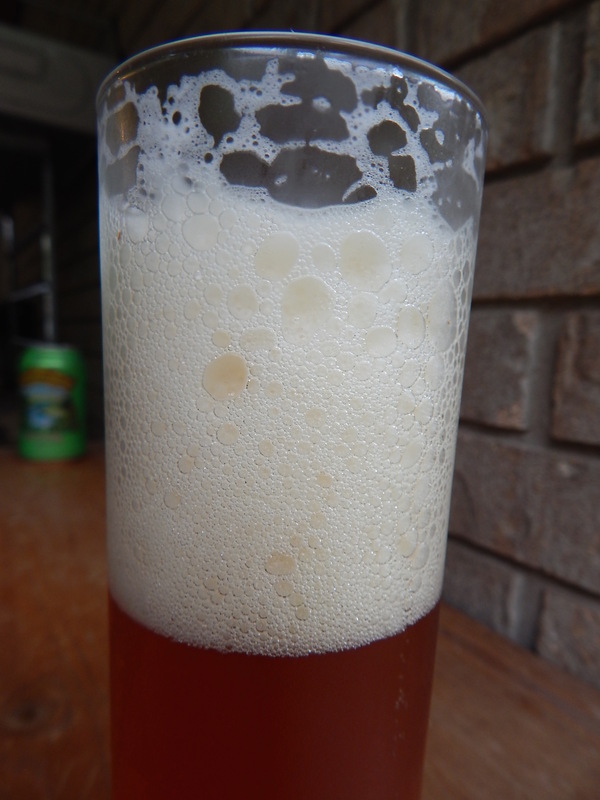 As a way to produce foam when your beers have none, however, adding wheat malt is not the way to go. When you brew, keep a brewing notebook that includes not only what your recipe was, but how things went on brew day and how the beer turned out. Evaluate your foam in terms of how much is produced (you can measure this as height above the liquid level in the beer), how long the foam persists, and if you get good lacing. See if any particular ingredient, including yeast strain, correlates well with foam amount, foam persistence, or good lacing. All-grain brewers should avoid mash rests in the 133–122 °F (45–50 °C) range. Overly long rests in this range, formerly called the protein rest range, will negatively impact foam. What is overly long depends on the malt. Undermodified malts require a rest in this range, often 20–30 minutes. However, most malts these days are fully modified. (You have to search to find undermodified malts and they will clearly be labelled as such.) Any rest in this range is not needed with a fully modified malt and should be avoided. Although most lipids in beer come from the yeast. oversparging your grain bed can yield too many lipids. You should already be avoiding oversparging, to minimize astringency, but it can also be detrimental to your foam. Fermentation is really when the potential for good foam is made or broken. During fermentation, yeast excrete alcohol, lipids, and proteinase A (along with many other fermentation byproducts) into the the fermenting beer. All of these elements are foam negative. In addition, the yeast will consume some of the proteins in wort, albeit not to a degree that precludes the formation of foam. 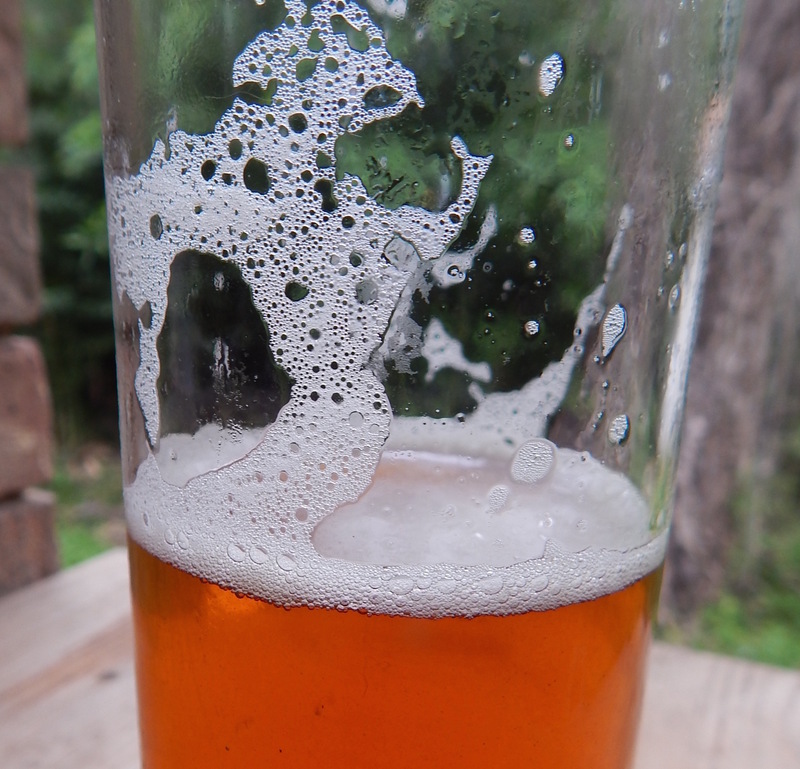 Beer has alcohol, and you can’t (and don’t want to) prevent its formation. Likewise, yeast will always excrete some lipids into the fermented beer. However, if you run a good, ordered fermentation, you will keep the level of foam negative elements below the level at which they are problematic. Pitching an adequate amount of yeast and aerating the wort throughly will ensure that the yeast mostly produce ethanol, and little or no higher alcohols (or “fusel oils’), which are more foam negative than ethanol. Likewise, healthy yeast cells are less likely to rupture (autolyse) and release their contents — including lipids — into the fermenting beer. And finally, the level of proteinase A excreted by the yeast will remain at acceptable levels as long as the yeast are healthy. Running a healthy, ordered fermentation adds foam negative elements to your beer, but it adds them at a level that still permits foam to form and persist for a reasonable amount of time. The proteins — and iso alpha acids, and other foam positive elements — that make and stabilize foam can only be used up. If you make your beer foam at any time prior to serving, you are decreasing the pool of foam positive elements in your beer. When transferring and packaging beer, you should already be exercising caution about splashing it around. Any agitation leads to oxygen getting dissolved in the beer and premature staling. If you force carbonate your kegs, keep in mind that the shaking method raises foam inside the keg and may degrade your beer’s foam when it is served. So, the real key to great foam is to pay attention to all the details in brewing that you should be paying attention to anyway. If you follow sound brewing procedures, you will be rewarded with not only quality beer, but quality beer with nice foam. If your foam has been suffering, the first thing to address is your pitching rate and fermentation practices, If you have been getting nice foam, but want more, adding wheat malt will help — but keep additions low enough that they don’t change the flavor of your beer or cause haze. In addition, note the quantity and quality of foam for each of your beers in your brewing notebook. Review your notebook to see if certain ingredients (particularly yeast strains) or procedures correlate with better or worse foam. Does water chemistry play a role? Yes, indirectly, through it’s influence on pH. Within the normal span of beer pH values, lower pH beer’s tend to show better foam.